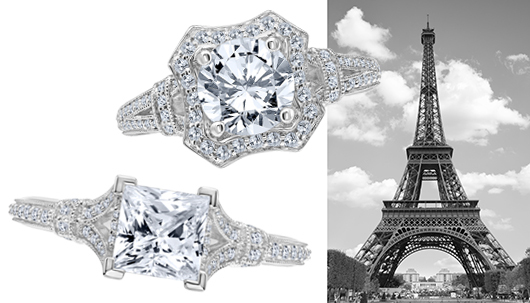 The feminine and romantic engagement rings and wedding bands of Karl Lagerfeld’s Tour Eiffel collection reflect the architectural geometry of the Parisian landmark. Halo shapes suggest the tower’s base, while milgrain beading is reminiscent of its rivets. Diamond-encrusted collars evoke the floors of the structure and an arch motif is presented in open gallery pattern. Your center stone will capture attention like the glistening lights that flash at the must-see attraction every night. Bridal jewelry from the Tour Eiffel collection joins the European architecture-inspired Pyramid, Perspective and Arch collections by the world-renowned designer. !